It is a portable camping house for travel, There are fly screens for both side windows and entry. The valve is high quality of rescue boat. And at the bottom, there are several strong fast D-rings to help the fixing. The roof is totally waterproof and flame-retardant Treated. 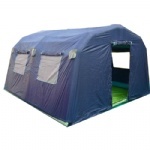 It is also uv resistant, all the specification are telling us this tent is very suitable for outdoor use. With this size, it is suitable for a family with three person or even a 4 person team travel. It is small pack size can be carried with a car. And it is very convenient to set up with the air pump. If no power, we have the Air pump with Car DC12V voltage. It is a first choice for easy outdoor camping.